Another excuse to stare blankly at my screen and talk to myself! Lately I have had a lot of opportunities to speak with Christians about what they would say to me if I were not a Christian, and I am getting rather frustrated at the painfully generic (or altogether absent) message that is being presented back to me. I have been told to “just believe”… what does that mean? Is that it? Then I was told, “The bible says that if you confess with your mouth Jesus as Lord, and believe in your heart that God raised Him from the dead, you will be saved” (Romans 10:9). Great! So what do I do with Matthew 7:21– “Not everyone that says to me, Lord, Lord, will enter the kingdom of heaven…” Didn’t they call Him Lord? Doesn’t it seem obvious that they believed He was resurrected from the dead? The problem is, to understand Romans 10:9, you have to understand what the Bible says about a person before that point. More specifically, that people are wretched sinners and they need a savior. So, Christians run to Romans 3:23– “for all have sinned”. The problem is, the world is perfectly fine with being called sinners. This is because the world has changed the definition of what sin is. Unregenerate people will say, “we all have made mistakes”, or “nobody’s perfect” and they twist sin to be mistakes and oops moments, or “learning experiences”. The Christian has to understand that sins are vile crimes against God. Everyone who sins is a fist shaking rebel against God and deserves hell for their crimes. After hearing that I have heard non-Christians so many times say- “if that is true, then NOBODY is going to be in heaven!” They don’t understand the Holiness of God. They have no clue about His justice and His hatred toward sin. Most people have a “group” mentality. They think, I’m not as bad as most people, and this type of generic language I keep hearing fosters that thinking. The reality is, on judgment day, that person will be standing alone before God, filled with wrath for the crimes that person had commited. That is why we need to make sin PERSONAL, because it is personal. People need to be shown that when they sin, it is a personal offense against the creator of the universe. James 4:9 wrote that we need to come to God mourning and weeping over our sins, letting our joy and laughter be turned to gloom and sorrow. When a person is broken, surrendering themselves to Jesus, dieing to themselves, then Romans 10:9 takes on a whole new meaning and understanding Matthew 7:21 falls right into place. But the ground work has to be laid first. Only a contrite heart will truly cry out to Jesus as Lord and that person’s hope will rest in resurrection of Christ that he has put his trust in. I don’t see ANY personal conviction of sin in any of the recent conversations I have had or tracts I have seen. Let me challenge you to look at the way you present the Gospel and the tracts you hand out. Do they present generic ideas of sin and belief, or do they explain what sin is and what true trust and repentance is? Children are SOOO easy to get decisions from! Whew! I have had a busy Christmas, and it has been awhile since I have posted. I think this post is perfect for opening up the new year. Did you happen to read the article I wrote on Children and Salvation? Well, I was looking around the Wretched Radio site and found this video that is posted below. Next I want to post on a critical issue that was brought up in this video that is called “Decisional Regeneration” and the implications of this popular theology. I want you think about something before my next post, does salvation belong to God, or do men have the power to save themselves? Beth Moore has a 2 minute audio ministry and on her Dec 9th spot, she talked about God’s wrath, and I applaud her for that topic. I think that needs to be a regular subject in our pulpits. What concerns me is that she does not think that our best approach to non-believers is to talk about God’s wrath, but his love. She tells us that God’s love is a huge draw and she justifies the “love only” approach with Romans 2:4, saying that God’s kindness leads us to repentance. This is a serious error in interpretation and we need to be clear on what scripture actually says. Mrs Moore clearly interprets Romans 2:4 as, telling people about God’s kindness leads them to repentance, but that is not what the verse says. The verse tells us that the fact that we are able to repent is evidence that God is kind. If Paul was telling us to tell people only about God’s love, then he violated his own teaching in Acts 24:25 when he spoke of the need for righteousness and the judgment to come. John the baptist said, “who has warned you to flee from the wrath to come?” And Jesus spoke often about the fires of Hell and commanded that people repent or perish. The Bible says that godly sorrow works repentance, not the knowledge that he is kind. James 4:9 tell us to “mourn and weep, letting our laughter be turned to sorrow and our joy to heaviness”. How does telling people that God loves them produce sorrow and heaviness without a personal conviction of sin and its consequences? Even the cross is evidence of God’s terrible wrath. Isaiah 53:10 said that it pleased God to CRUSH HIM. The fact is, that Christ centered witnessing needs God’s wrath to allow His love make sense. I saw an interesting interview on Beliefnet with Rick Warren, and the interviewer brought up some things that I believe we need to be able to answer- correctly. If we do not have a firm, biblical foundation, the theology we build on that foundation gets way out of wack. We end up inserting what we think, instead of what scripture says. Please understand that I am not trying to single out Pastor Warren, but I feel an obligation to speak up against bad theology, no matter who it is. Pastor Warren’s messages are mixed with solid truth one minute and bad theology the next. For example, Pastor Warren says loud and clear that Jesus is the ONLY way to get to heaven– YEAH! But then he will say to the unsaved that God is not angry at them– EXCUSE ME? Doesn’t scripture say something about God’s anger and wrath on unbelievers? And these errors are not on some secondary issues, these are serious problems that effect how people respond to the gospel. These are FOUNDATIONAL issues. Before watching the interview, there are a few basic things I want you to think about as you listen. People are not sent to Hell just because they don’t believe in Jesus, they are sent to Hell primarily for breaking God’s laws. The Bible tells us that liars and thieves, adulterers, idolaters, covetous, and the sexually impure (and other law breakers) will not inherit the kingdom of heaven. Unbelief IS a sin, but it is not the primary reason people are sent to Hell. What happens to those who have never heard of Jesus? The Bible says that everyone is given a conscience (Rom 2:14-15). People know it is wrong to lie and steal and commit adultery. So if someone does not sin, they will be fine, but if they have broken the law, then they will be guilty before God, and will be judged according to light that they have. If non-believers die in their sins, they are judged for ALL the sins they have committed. Every one. Every sin requires payment. Every sin requires that justice is done. Either you repent and put your faith in Jesus, and the price He paid for our sins , or you pay for your own sin be spending an eternity in Hell. See if you can spot the “personal” beliefs of both the interviewer and Pastor Warren that have no basis in scripture. Rick Warren was on Hannity and Colmes last week (Dec 4th) where he was promoting his new book, The Purpose of Christmas. I think the interview was very interesting and disappointing. I also think that understanding why this was a HORRIBLE gospel presentation can help us in presenting the gospel the correct way and give people a real reason to turn to Jesus this season. Here’s the video, watch it and lets reason this out together. Right off the bat, I see a problem. Salvation is mentioned, but what are people being saved from? They need to be saved from the wrath of God that is going to be poured out on those who do not know God. Pastor Warren does nothing to tell people WHY they need a savior. The cross is foolishness to those who are perishing. Most men will proclaim their own goodness. Pastor Warren basically says that we need a savior because God said so. That is extremely inadequate. Secondly, just “unrapping” the gift is not enough. People are stuck on accepting Christ, but that is so lukewarm and trivial, it has none of the weight that the Bible attaches to salvation… dieing to yourself, picking up your cross daily, forsaking sin, total surrender of one’s self as a living sacrifice to God. There is no repentance in Pastor Warren’s message. No brokenness. When James said to weep and mourn over your sins, letting your laughter be sorrow and your joy to heaviness, I don’t think that was code for “accept Jesus into your heart”. Pastor Warren was asked a specific question about what happens to people who do not “accept” Jesus. The answer was typical for someone who does not build a foundation on the Law of God. There was no judgment, no wrath, no Hell in Pastor Warren’s message (and no cross for that matter). How can a god who loves me be angry at me? Colmes did not seem to think he needed a savior. And the last point, and the biggest gripe I have, is… TRY JESUS? What is He, a used car? A pair of jeans that you try on just see if they are a right fit for you? Pastor Warren challenges people to put their trust in Jesus for 60 days like He is some life improvement infomercial. Jesus did not suffer and die so you could try Him out and see if He makes your life better. In fact, the only things promised for a Christian in this life are trials, tribulation, and persecution. Can we receive blessings like a better marriage, or emotional healing from our walk with Christ? Yes, but if you come to Christ because you want something, no matter how bad your situation, then you come with a wrong motive. If you d0 not come to Christ because you are a guilty criminal in need of a savior, then God will not save you. Jesus Christ is the sovereign God of the universe, and we are supposed to give Him a shot at being Lord of our lives? Like He is going to say, “oh goody, I get to be Lord today!” He IS Lord, whether you live in rebellion to that fact or not. The only thing Pastor Warren’s message will serve to do is water down Christianity and create false converts. A Christian who never broke a commandment? She said that she was trying to do the right things in order to get into heaven- reading her bible, being good, praying, etc… So I said, “Did you know that God was going to judge us by the 10 commandments? How do you think you do if God did that?” To that she said, “Oh, I think I would pretty good.” So I started taking her through some of the commandments.. here is how it went. See what I mean? I just don’t get it!! Isn’t Christianity supposed to be about forgiveness of SINS?? Why join the club if you’re not a SINNER?? It is important to remember that just because someone attends all the church functions, or carries a Bible around, or lifts their hands in praise to God, it doesn’t mean that they are a child of God. I will talk about what a true Christian looks like later. At a church that I have been visiting, they had their annual friend day, which reported some impressive numbers visiting Sunday School. The evening service was mostly dedicated to talking about what happened and it kind of left me with a heavy heart. Let me tell you what I experienced and show you my perspective. The numbers were outstanding. it was reported that, overall, there were more vistiors than all the goals of the individual Sunday School classes combined. Therefore, God MUST have been in this effort. It was also reported that a lot of people worked very hard in inviting people to come. They were persistent, asking people over and over. Even going so far as getting people to sign commitment cards and mailing it back to them before the service to remind them to come. They emphasized the hard work that people went through to invite people. Let me say that I don’t mind people inviting someone to church, but I do have an issue with church being an outreach program. Let me be absolutely clear, you are not fulfilling the great commission by inviting someone to church. That is NOT evangelism! Our churches seem to spend massive amounts of time, effort, money, and prayer getting people into our churches, but what we should be doing is pouring this effort in equiping the members to GO OUT and preach the Gospel to every creature. You want your church to grow? THEN GO OUTSIDE THE WALLS OF YOUR CHURCH WITNESS TO SOMEONE!!! Tell a stranger about sin, judgment to come, righteousness, and give them the Gospel of our Lord Jesus Christ. If you want to say that the numbers verified that God was working in this effort, then I would have to say the same thing for Joel Osteen’s church, or Rick Warren’s, or Rob Bell’s, or Perry Nobel’s, or Bill Hybel’s. Is it possible this was a man centered effort, producing a result from hard work instead of divine blessing? I think we have lost our orginial mandate and we have looked to our pastor to do the heavy lifting. That is why my heart is heavy. 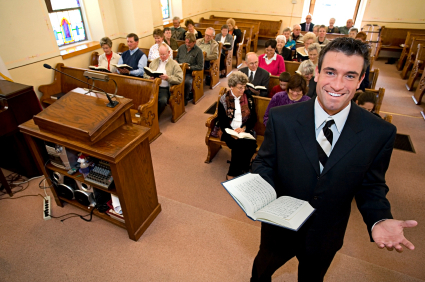 Is Sunday morning your church’s outreach program? Most churches tell their members to reach out and invite people to church in hopes that they might hear the gospel, and give their lives to Christ. Even visitation is about getting people to come to our church. So what does Scripture tell us about outreach and what is the primary role of the church? First and foremost, church is about God, not people. Believers coming together to worship Him. Church is also about fellowship- “forsake not the gathering of the saints together” (Heb 10:25). Another function of the church is “for the equipping of the saints for the work of service, to the building up of the body of Christ” (Eph 4:12). The church instructs us for the outreach that we are supposed to be doing outside of the church walls. Non-believers are welcome, but church is primarily for believers. “Go into all the world and preach the gospel to every creature”. Each one of us has been commanded to go. Just inviting someone to church or saying “Jesus loves you” does not fulfill your obligation. One local group I know of did a prayer walk and they thought that was “outreach”. It’s not. Reaching out is when you reason with someone about sin, judgment, righteousness, or Hell (Acts 24:25). Reaching out is when someone is given the gospel of Jesus Christ. Outreach is not the responsibility of your pastor, it sits on our shoulders to take the gospel into a dying world. Are you ready to go? Yep, this is me. The one staring blankly at the screen and talking to myself.